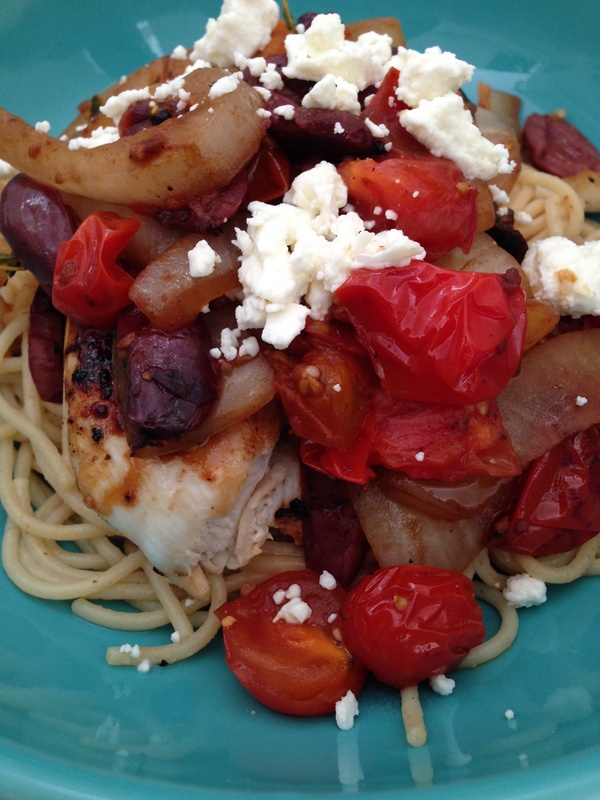 I’m excited to share I found another summer dish I can’t get enough of: Greek-Style Chicken Breasts from Cooking Light’s May issue. It brings together all of the wonderful Mediterranean flavors while being light and refreshing, perfect as the weather gets warmer. Heat a grill pan over medium-high heat and coat with cooking spray. Sprinkle chicken with salt and pepper and add to the pan, cooking for 6 minutes on each side. Heat a large skillet over medium-high heat, add the oil and swirl to coat. Then add onion and garlic, saute for 4 minutes, then add the olives and tomato. Cook everything for 3 minutes or until the tomato begins to break down. Remove the pan from the heat and stir in the parsley oregano and lemon juice. Lastly, top the chicken with the tomato mixture and sprinkle with feta. Cooking Light serves this dish with herbed gold potatoes but I also found this dish pairs exceptionally well with pasta or quinoa. Adding a grain definitely rounds out the dish–I highly recommend it! The only thing that could make this dish better would be to have a deck or patio I could eat it outside on 🙂 Test this chicken out–it’s quick and absolutely delicious–you won’t be disappointed (I’m ashamed to admit I ate almost the entire pot, it’s THAT good). But until next time, keep eating! I have a newfound love: my crock pot. It literally is one of the best inventions made (kudos to whoever you are). I love the way it makes your entire apartment smell like a little bit of heaven. I do have to admit I’ve only made a few dishes in it so far but this is one that keeps me coming back: Slow-Cooker Spicy Buffalo Chicken Sandwiches (the name says it all). The way the chicken cooks down and absorbs the incredible sauce of hot sauce, mustard, Worcestershire, and molasses, it literally melts right off the bone. Divine. In a large skillet, heat oil over medium-high. Add chicken and season with salt and pepper. Cook stirring once, until meat is golden brown (about 5 min.). Once done, transfer to the crock pot with a slotted spoon. Next, to the same skillet, add onion, garlic, bell pepper, and cook over medium for about 6 min. Add 1/4 c. water and cook, scraping up browned bits, for about 5 min. Season with salt and pepper and transfer to the crock pot. Then add the tomatoes, hot sauce, Worcestershire sauce, mustard and molasses and stir to combine and cover all the chicken. Cover and cook on high for about 4 hours. Shred, season with salt and pepper, and serve with hamburger buns. 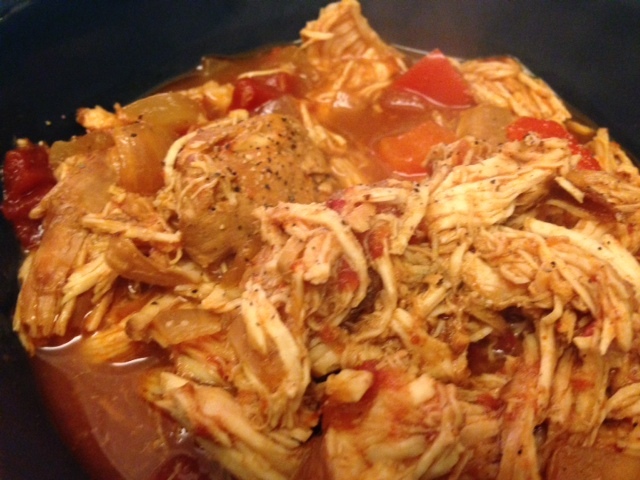 If you have a crock pot, bust it out and try this recipe! You can prep it before work, turn it on, and when you come home have an amazing meal waiting for you–the smell of this dish alone will be enough. The best part is too is that it makes enough for extra meals during the week (which is a total bonus considering a get lazy some nights and refuse to cook.) Test it out, you won’t regret it. But until next time, keep eating! 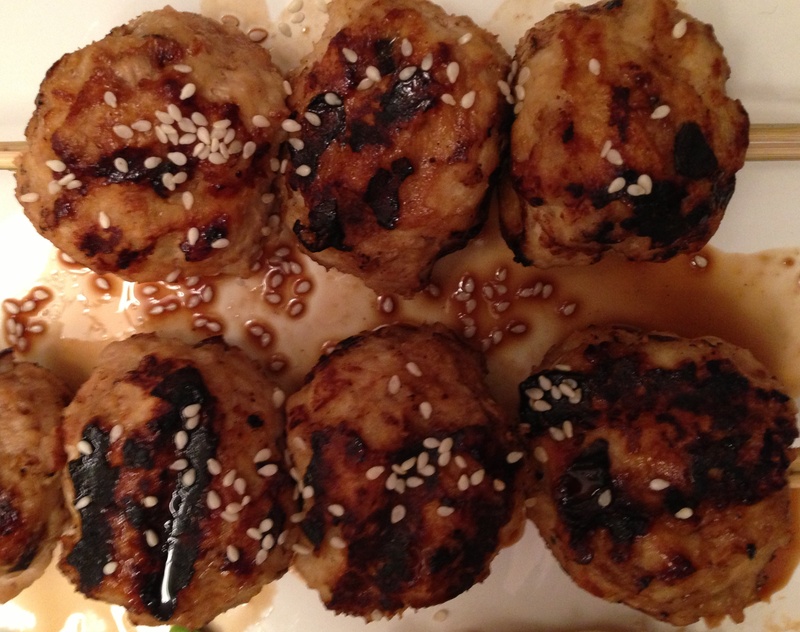 For the meatballs you’ll need: 1 tablespoon dark sesame oil; 4 oz. sliced shiitake mushroom caps; 1 1/2 tbsp. minced peeled fresh ginger, divided; 1 1/2 tbsp. minced garlic, divided; 2 tbsp. dry sherry; 2 tsp. red miso (soybean paste); 1 1/2 lbs. ground chicken; 1/2 c. panko; 2 tsp. cornstarch; 1/2 tsp. freshly ground black pepper; 1/4 tsp. kosher salt; 2 green onions, thinly sliced; 1 large egg white. For the sauce you’ll need: 3 tbsp. mirin (sweet rice wine); 3 tbsp. lower-sodium soy sauce; 1 tbsp. dark brown sugar; 2 tsp. sherry vinegar; 1 tbsp. lime juice; 2 tsp. grated peeled fresh ginger; 1 serrano chile, thinly sliced. Steps to making these delicious meatballs: Heat a skillet over medium-high heat; add oil, swirling to coat. Add the mushrooms, 1 tbsp. minced ginger, 1 tbsp. garlic and saute for about 2 minutes. Add the sherry and cook another 3 minutes. Remove from heat and place in a blender and process until very finely chopped. Then combine the mushroom mixture, 1 1/2 tsp. minced ginger and garlic, chicken and next 6 ingredients (through egg white) in a bowl. Shape into meatballs and put onto skewers. Chill for 30 minutes. For the sauce combine mirin, soy sauce, sugar and vinegar in a small saucepan; Bring to a boil and cook for 3 minutes. Remove from heat and stir in juice, 2 tsp. grated ginger, and serrano (reserve 2 tbsp. sauce). Heat a grill pan over medium heat, place the meatball skewers in the pan and cook until brown on all sides. Sprinkle with sesame seeds and serve with sauce. Voila! There you have it–delicious meatballs. 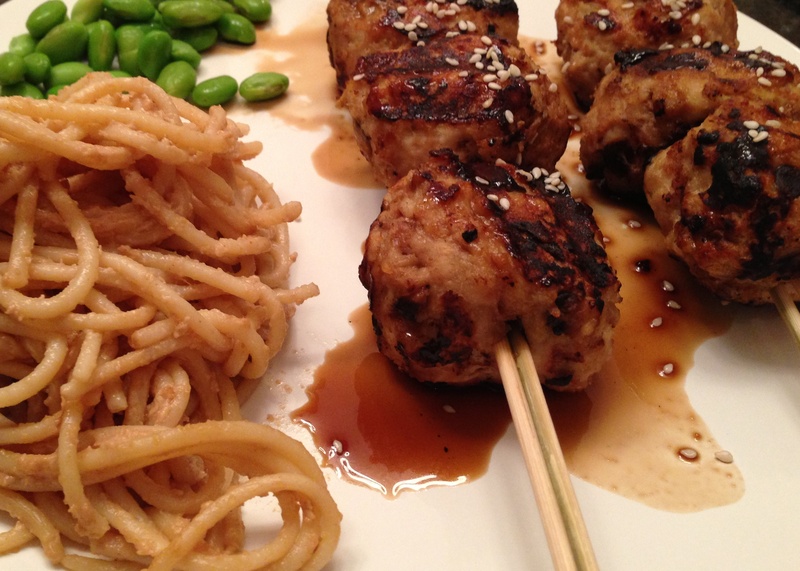 I served these with edamame and cold sesame noodles; all together the flavor profiles of this dish were exquisite. The heat of the meatball was complimented by the chill peanuty flavor of the noodles almost perfectly. You can serve these with rice or broccoli, whatever floats your boat. But until next time, keep eating!